As the world celebrates Dr. Martin Luther King’s life, his stirring and enduring vision collides with a resurgence of white supremacy and America’s growing racial chasm in income, wealth, opportunity and freedom. A major study on inequality released January 15, on what would have been Dr. King’s 90th birthday, shows that wealth has been concentrating into fewer and fewer hands in the 50 years since his assassination. The story of our nation is increasingly one of two America’s, one of gated communities and unfathomable opulence, and another of inescapable debt and perpetual precarity. Black, Latino and Indigenous Americans have shouldered the greatest increase in poverty and hardship in this second Gilded Age. The median family wealth for White families today is $147,000. Meanwhile Latino families have just $6,600 to their name and Black families have only $3,600. The richest 400 Americans own more wealth than all Black households combined, about 42 million people. Dr. King understood that if our country maintained its exploitative economic and political systems we would produce a metastasizing racial and economic apartheid. That is why MPP continues its national partnership with the Poor People’s Campaign, which carries forth the legacy of Dr. King’s original PPC, founded at a staff retreat for the Southern Christian Leadership Conference in November 1967, where the reverend identified the three evils of racism, poverty and militarism that still plague us today. It is why we engage in nonviolent direct action by picketing with strikers, engaging in boycotts, and occupying a government that neither speaks nor cares for its people. Dr. King made civil disobedience the hallmark of his organizing after a series of setbacks in the courts, realizing that it was necessary on the path to power. 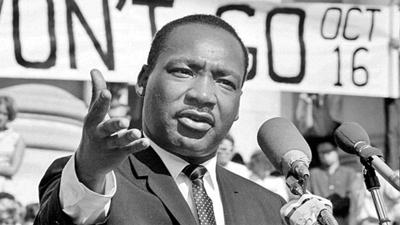 The reverend, a political independent, taught that only through union organizing could workers of all backgrounds achieve the beloved American goal of “opportunity for all.” That is why, 50 years after Dr. King delivered his final sermon, we have joined with The Organizer and a dozen unions and organizations representing more than 100,000 members to found the Labor-Community Campaign for an Independent Party. May we finally realize his vision. Posted in Announcements and tagged Dr. Martin Luther King Jr.